Have you ever been around parents that seem to have a super-close relationship with their kids? I love being around those families! I also feel blessed to enjoy a close-knit relationship with my children. Heart-to-heart connections are one simple piece of the happy home puzzle. These simple, daily connections help cultivate a healthy and loving relationship between parent and child. Do you desire to break down the wall of communication between you and your child? 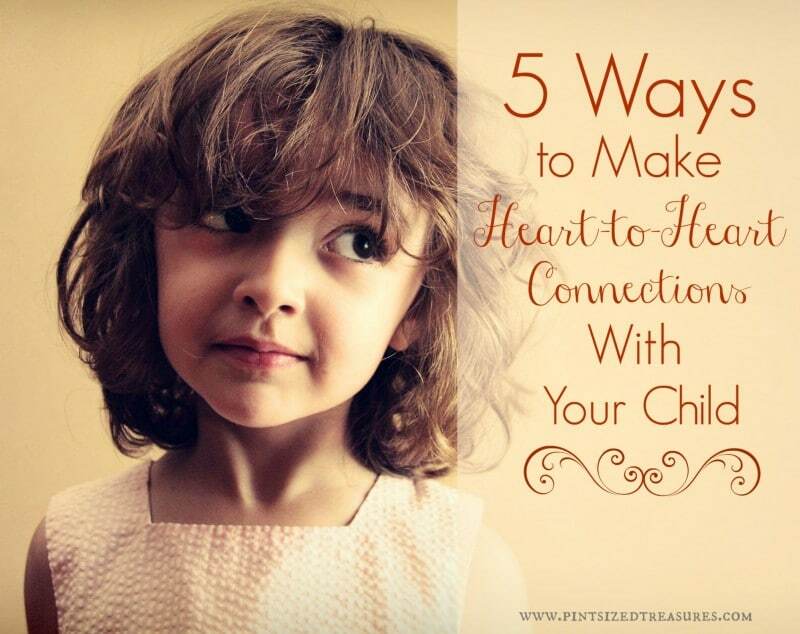 These simple connections will do just that and help you connect with your child on a deeper level. You don’t need one hundred parenting books or 18 hours of parenting classes to enjoy heart-to-heart connections. You simply need a desire to do whatever it takes to create a loving relationship. 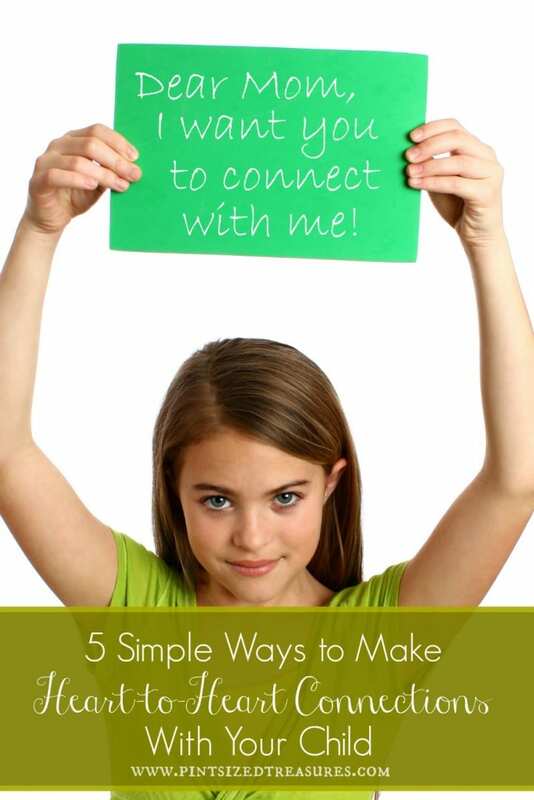 Here are five ways to help you and your child connect on a daily basis. Try it and see the positive changes in your relationship! Get down on your child’s eye level. This is crucial. Many times you will see me or my husband squat down so we can have a conversation with our preschoolers on an eye-to-eye level. Sometimes we sit on the floor or pull up a chair. Any way we can get on our child’s eye level so our child knows that we are interested and engaged in the conversation. Take time to listen. When your child is talking to you, don’t block out their words while you ponder about current events, friends, or the latest Facebook happenings. Instead, stay tuned in when your child is speaking. Ask thought-provoking questions about the subject at hand so your child knows you are really engaged. Give out dozens of hugs. Don’t limit yourself to hugging your kids before you leave the house or before bedtime. Your child needs way more hugs than that! 19 hugs a day is a fun number to stick to. Even if you don’t get them in during the day, make them up at night and watch the giggles come. My kids always come up to me and say, “Mom, I didn’t get ALL my hugs today!” After I gave my daughter her 19 hugs she smiled and said, “I love you soooo much and I am NEVER getting married!” It made her brothers and sisters laugh! From time to time I grab a few and read through them to see what the latest mystery is. This way we can all chat about the exciting parts in their favorite stories! I also bake with the girls and play soccer with the boys. Whatever sparks each child’s interest, I try to get involved so that we can connect over something they love or enjoy. One of my daughters loves sign language, so we often sign words to each other! Whatever your child loves, get involved in some way! Treat them as precious little people — not annoying creatures. Have you ever been around adults that constantly crack jokes or make fun of kids? It really disgusts me. They will smile at the kids, and then turn around and say something to an adult like, “Guess you had to be there.” It’s never funny to put down your child or never consider their thoughts or feelings because they are children. The fact is, they are small human beings and should be treated as such. Kids aren’t completely resilient and they will remember your sarcastic remarks, your irritated body language that tells them they are a nuisance. If you want to create a closer connection between you and your child, you have to view them as tiny, special people. Do you enjoy a close-knit relationship with your child? How do you make heart-to-heart connections on a daily basis? Please share your thoughts in the comments!